William Edward Burghardt (“W. 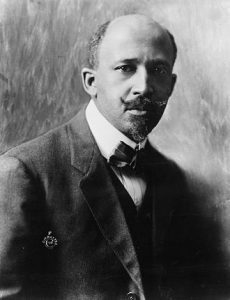 E. B.”) Du Bois (February 23, 1868 – August 27, 1963) was an American sociologist, historian, civil rights activist, Pan-Africanist, author, writer, and editor. Born in Great Barrington, Massachusetts, Du Bois grew up in a relatively tolerant and integrated community. After completing graduate work at the University of Berlin, and at Harvard, where he was the first African American to earn a doctorate, he became a professor of history, sociology, and economics at Atlanta University. Du Bois was one of the co-founders of the National Association for the Advancement of Colored People (NAACP), in 1909. Du Bois rose to national prominence as the leader of the Niagara Movement, a group of African-American activists who wanted equal rights for blacks. Du Bois and his supporters opposed the Atlanta compromise, an agreement crafted by Booker T. Washington, which provided that Southern blacks would work and submit to white political rule, while Southern whites guaranteed that blacks would receive basic educational and economic opportunities. Instead, Du Bois insisted on full civil rights and increased political representation, which he believed would be brought about by the African-American intellectual elite. He referred to this group as the “Talented Tenth,” and he believed that African-Americans needed to pursue advanced education to further develop its leadership. Racism was the main target of Du Bois’s polemics, and he strongly protested against lynching, Jim Crow laws, and discrimination in education and employment. His cause included people of color everywhere, particularly Africans and Asians in colonies. He was a proponent of Pan-Africanism, and he helped to organize several Pan-African Congresses to fight for the independence of African colonies from European powers. Du Bois made several trips to Europe, Africa, and Asia. After World War I, he surveyed the experiences of American black soldiers in France, and he documented widespread prejudice inside the United States military. He wrote one of the first scientific treatises in the field of American sociology, and he published three autobiographies, each of which contains insightful essays on sociology, politics, and history. In his role as editor of the NAACP’s journal, The Crisis, he published many influential pieces. Du Bois believed that capitalism was a primary cause of racism, and he was generally sympathetic to socialist causes throughout his life. He was an ardent peace activist, and he advocated nuclear disarmament. The United States’ Civil Rights Act, embodying many of the reforms for which Du Bois had campaigned his entire life, was enacted a year after his death.